Second wave. Aircraft badly damaged and mine lost, flying low over sea on outward flight. Returned to base. Geoffrey Rice was born on 4 January 1917 in Hinckley, Leicestershire, the son of Frederick and Anne Rice. He went to Hinckley Grammar School and was then apprenticed in the hosiery trade. Rice joined the RAF in 1941 and was selected for pilot training, which he undertook in Canada. He qualified as a pilot in February 1942 and was commissioned. 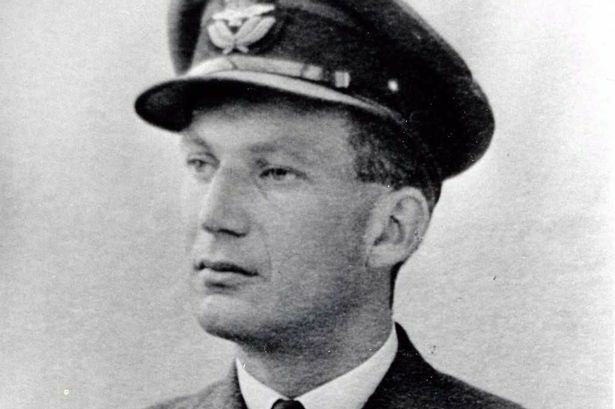 On his return to the UK he underwent further training and was crewed up with the six other men who would eventually fly with him on the Dams Raid. They were finally posted together to 57 Squadron at RAF Scampton in February 1943 to begin operations. By the middle of March, they had undertaken nine operations, at which point they were placed in the squadron’s new C Flight, under the command of Sqn Ldr Melvin Young, an experienced pilot about to embark on a first tour on Lancasters after winning a DFC and Bar for two tours on Wellingtons. By 26 March 1943 the flight comprised four crews, captained by Melvin Young, Bill Astell, Geoff Rice and Sgt Ray Lovell. It was decided to post the whole flight over to the new squadron being formed at the same base to undertake training for a special mission. Rice protested at this, but to no avail. However the crew had gelled as an effective unit and the training for the secret operation went well. They achieved impressive scores in bomb aiming exercises and were chosen to fly in the second wave, tasked with attacking the Sorpe Dam. AJ-H took off from Scampton at 2131 and all went well for the first hour and a half of flying time. They crossed the narrow neck of Vlieland at 2259 flying very low and exactly on track. Past the danger point, Rice gained altitude briefly to check position and then went low again to turn south-eastwards towards the Ijsselmeer. The bright moon shining on the water made height difficult to judge and flight engineer Edward Smith was about to warn Rice that the altimeter was reading zero when there was a huge jolt. Instinctively Rice pulled upwards and felt another ‘violent jolt’. AJ-H had hit the water twice. The first impact had torn the mine free and sprayed water up through the bomb bay. The second had forced the fixed tail wheel up through the fuselage and demolished the Elsan lavatory just in front of the rear turret. A revolting mixture of its contents, disinfectant and sea water had poured into the turret and immersed gunner Stephen Burns up to his waist. His shout of ‘Christ, it’s wet back here!’ was pretty understandable. Everyone else was shaken up, but by some miracle the aircraft and crew had survived. Rice flew on for a minute or two while the damage was assessed and it was confirmed that the mine had been lost. Then he turned for home. The anti aircraft batteries on both Vlieland and Texel were waiting for him and sprayed flak across the gap between the two islands but he sped underneath the fire. There was nearly another tragedy as they reached Scampton. The hydraulic fluid in the undercarriage had been depleted, so it had to be manually lowered with an air bottle. This took 20 minutes during which time Rice was circling the airfield at 1000 feet. Uncertain whether the flaps would then work, another warning message was sent to the control tower, and the crew prepared for an emergency landing. Rice and Smith remained in their seats while the rest sat with their backs to the main spar, facing aft. They were just about to make their approach when suddenly Les Munro’s AJ-W, which had lost its radio, flew in below them and landed on the main runway. Rice held off, and touched down a few minutes later. The next day, Gibson quizzed him over the cause of the loss of his mine, but took no further action. He knew from his own experiences in training how difficult it could be to judge an aircraft’s height when flying low over water. Rice flew on the operations to Italy in July and August, and was then selected for the very dangerous attack on the Dortmund-Ems canal with the new 10,000lb ‘thin case’ bomb in September 1943. Of the eight pilots who flew on that raid, only Geoff Rice, Mick Martin and David Shannon survived. In appalling weather conditions, Rice spent 70 minutes searching for the target but was eventually ordered home by Martin, who had taken over temporary command of the operation. He jettisoned his giant bomb over the Waddensee. On 20 December, eight 617 Squadron crews, led by the new CO Leonard Cheshire, were sent on an operation to attack an armaments factory in Liege in Belgium. Geoff Rice and his Dams Raid crew were amongst them. The target marking wasn’t visible so Cheshire ordered the crews to return with their bombs. However, Rice and his crew were unlucky and were hit by flak 14,000 feet above Merbes-Le Chateau. The last thing Rice remembered was giving the order to bale out. Unfortunately, there wasn’t time and the aircraft exploded. Rice appears to have been thrown clear, protected by the pilot’s armoured seat and with his parachute deployed, but all his colleagues died as it crashed. Their bodies were found near the crash site, but Rice regained consciousness in a wood, his parachute snagged in a tree, and with a broken wrist. The first people he met were three farm labourers, who took him to the Resistance. His wrist was set in plaster by a friendly doctor, and he spent the next five months on the run. Unfortunately, he was then betrayed to the secret police and became a prisoner of war, ending up at the notorious Stalag Luft III, scene of the Great Escape. As the Russian army approached, the prisoners were forcibly moved, but were eventually liberated by the Americans. Rice was repatriated after the war, and left the RAF in 1947. He went on to work for Shell BP and was very active in setting up the 617 Squadron Association. He died in Taunton, Somerset on 24 November 1981 and was cremated at Taunton crematorium. His ashes were buried in the churchyard in the village of Aller, where he had lived for a number of years. Report in Leicester Mercury about the awarding of a ‘green plaque’. Among many other things, this completely belies the line that the less efficient crews were chosen for the Sorpe attack. Every one of those crews was first-rate. Makes me shake my head, and more. Rice and crew were shot down by Hauptmann Kurt Fladrich, a Staffel Kapitan of 9.NJG/4 based at Juvincourt. The combat took place at 20.29 at 4,200 metres over Merbes-le-Chateau. He attacked from behind and below in his BF110G4, setting the starboard-inner engine on fire, and, in his report, misidentified the aircraft as a Halifax.